For the Full Report in PDF Form, please click here. Alert: Large File. 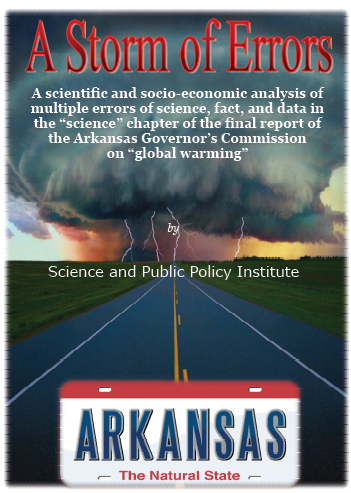 In October of 2008, the Arkansas Governor’s Commission on Global Warming issued its final report to you and the Arkansas General Assembly. That report contained 54 recommendations for actions the state of Arkansas could take to mitigate the potential impacts that global warming might have at a projected cost of $3.7 billion spread over 17 years. Although the legislation that created this commission directed it to study the science of global warming and consider the economic impact, unfortunately the commission did neither. 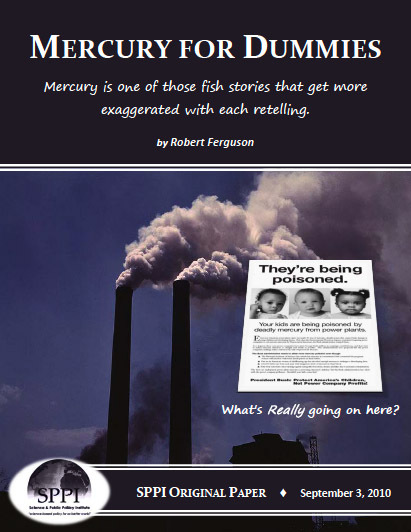 In fact, in a 490 page report only four and one-half pages citing scarcely a dozen documents, none of which were peer-reviewed papers appearing in scientific journals, were presented as evidence of anthropogenic global warming. Rather than study the science a basic assumption was made by the consultant — and commissioners were presumed to agree with the premise — that activities of man contribute significantly to dangerous climate change. The economic projections of the costs associated with the commission’s recommendations fall far short of reality as well. For these reasons the Science and Public Policy Institute of Washington, D.C. has prepared a detailed scientific and socio-economic analysis of the “science” chapter of the report only and we present it to you as a public service. While some of the recommendations involving energy efficiency make perfect sense regardless of climate, too many recommendations contained in this report would result in Arkansans paying high costs for questionable or non-existent benefits.